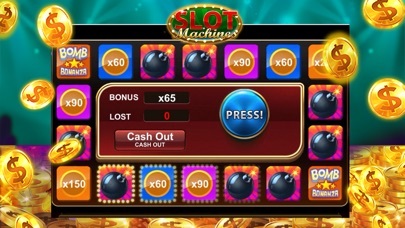 Real Vegas Slots Experience – FREE! 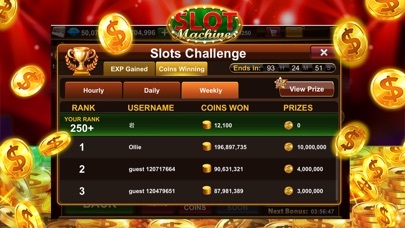 Fastest growing Slots App on App Store! IGG PRESENTS — Slot Machines – An exciting, new game from the creators of Texas Hold’Em Poker Deluxe! 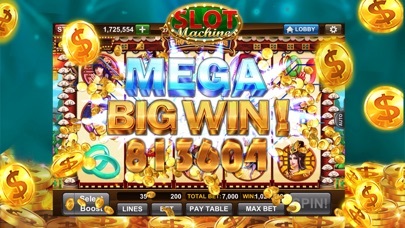 Now available on App Store, Slot Machines boasts gorgeous graphics, immersive and exciting gameplay, and dozens of interactive Bonus games that are sure to provide hours of fun! 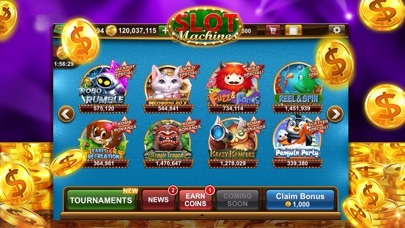 Claim free bonuses, climb the leader board, and hit the jackpot! There’s never a dull moment in Slot Machines! Don’t wait. Download your copy today for FREE! Game Features: * Fun and interactive Bonus games * THOUSANDS of Free Coins throughout the day! * Auto-Spin for easy, hands-off play * Multi-million Jackpots to win! * VIP service and exclusive bonuses for STAR members! * Use Boosts to increase your winnings! * Unlock achievements to win extra Coins! * Weekly Tournaments! * Bankruptcy Insurance * Competitive Leaderboards! * And much more to come! * Insurance feature Log in with Facebook to continue your progress on different devices! 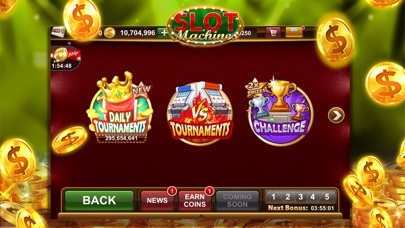 Slot Machines will be coming to Facebook soon! Stay tuned for more updates! This game used to be fun but now you don’t get all your coins you won. I won 196,000 coins and it only gave me 196. What’s with that? I GIVE ZERO STARS. SINCE JANUARY I HAVE SENT 8 EMAILS AND HAVE RECEIVED REPLIES ASKING ME OVER AND OVER AGAIN FOR THE SAME INFO. I EVEN SENT THEM A SCREEN SHOT OF THE JACKPOT I WON AND RECEIVED NOTHING FOR IT. NOW I GET AN EMAIL TELLING ME THAT ITS TOO OLD AND THEY CANT GO BACK THAT FAR. WHAT A RIPOFF THIS GAME IS. NOTICE YOUR WINNERS AT THE TOP OF YOUR SCREEN. IT IS ALWAYS THE SAME NAMES WHO WIN THE JACKPOT. PROBABLY NO SUCH PERSONS. AND IT IS QUITE OBVIOUS THAT THEY COULD CARE LESS ABOUT THE REAL PLAYERS. BUT THEY ARE NOW BEING INVESTIGATED SO LETS SEE WHAT THEY THINK NOW. AND HERE I AM AGAIN COMPLAINING. WHAT A RIP OFF THIS IS. I PAID FOR COINS AND RECEIVED NOTHING. WENT ON THE LIVE ASSISTANCE AND ALL THEY TELL YOU TO DO IS GET YOUR RECEIPT FROM ITUNES AND THEN SEND THEM A SCREEN SHOT OF THE RECEIPT AND THEN WAIT, WAIT AND WAIT AND GET NOTHING FOR WEEKS AND WEEKS. THEN THEY TELL YOU THAT YOUR COMPLAINT IS TOO FAR BACK AND THEY CANNOT CHECK. ITS THE SAME WHEN YOU WIN A JACKPOT. THEY WAIT AND WAIT AND THEN TELL YOU THAT IT WAS TOO LONG AGO AND THEY CANT CHECK. BUT, ALL THE WINNERS ACROSS THE TOP OF THE SCREEN ARE THE SAME NAMES OVER AND OVER AND OVER AGAIN. HMMMMMMM----I AM DONE FOUND MUCH BETTER GAMES WITH AWESOME PAYOUTS AND OFFER BETTER COIN PACKAGES. WHAT A POOR WAY TO DO BUSINESS. Igg is a Chinese based company.. There thieves... I won several times on slots no payout.. Don't ever an I stress EVER give your money to this company.. If you ever have a problem they will just ignore you.. I also played the igg poker called poker deluxe I've never in my life had so many chips stolen out of igg crimes. If this wasn't a chinese based company they would be shut down right away..
Fun but needs lots of HELP. It's fun to play but has tons of bugs that need to be fixed. They have 8 minute tournaments that are fun to play. Only problem is most claim they last 8 minutes, but after you enter it could be already halfway over. You won't even have time to spend all chips provided. WASTE of chips, especially if you buy chips. They have a wheel to spin after you place in a certain amount of tournaments and get 3 different bonuses along the way. Problem is, it will start you over from the beginning frequently. Last 2 times I was going after the spinning wheel, and very close, it put me back at the start. It still currently shows for a split second I'm at the "claim" prize on the final prize (spin) but goes away and back to the start. I even recorded it in slo-mo and sent to support with no help. I have also had bonuses and scatters on my timeline and they never activated. It's a fun game to play, I like it a lot, but refuse to spend another dime to their company. I'm seeking another app now that I enjoy with less flaws and better support. Rather my money go to something that works halfway right and has support that will make things right with you when they are at fault. First of all I purchased gems, I never received them! I have been emailing the support team, they have done nothing but call me a lier! They tell me they reviewed my purchase and it was successful, they took my money and gave me nothing. Now I click on the game it flashes on, then off.. I play multiple times a day and want to collect my bonus!! Help!! WORST slot game, very little payout!!! DO NOT spend your money on buying coins, YOU WILL NOT WIN! Was playing a tournament and I got three of the jackpot symbols, it said I won 10k and it never added it to my coin area. Tournaments are supposed to pay out for top 1/3...sometimes they pay, sometimes they don't. It doesn't matter if you're number one in the rankings....it's been like this for months and they won't fix it. Can't send help tickets on iPhone because of a glitch (probably intentional) so if u don't send a help ticket u don't get the credit you're owed. Sent emails regarding these issues but never get a reply. Slots won't pay out. Don't give them your money !!! !